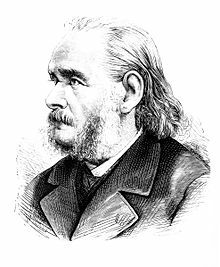 Matthias Jakob Schleiden (5 April 1804 – 23 June 1881) was a German botanist. He was long supposed to be the co-founder of the cell theory, with Theodor Schwann and Rudolf Virchow. However, a recent study of the original papers revealed that Schleiden and Schwann used previous research, and were popularisers of an idea others had discovered. The key works of Schwann and Schleiden were published in 1838 and 1839. These ideas still are the basic ideas of cell theory. ↑ 1.0 1.1 Harris H. 1999. The birth of the cell. Yale University Press, New Haven. ↑ Schwann, Theodor 1847 . Microscopic investigations on the accordance in the structure and growth of plants and animals. London: Sydenham Society. This page was last changed on 4 March 2019, at 18:54.